In the second of a series of three Development Drums podcasts about the relationship between citizens, states and development, Duncan Green talks about effective states and active citizens. Duncan is widely known for his terrific development blog; he is also the author of an ambitious book, From Poverty to Power, which is now out in its second edition. 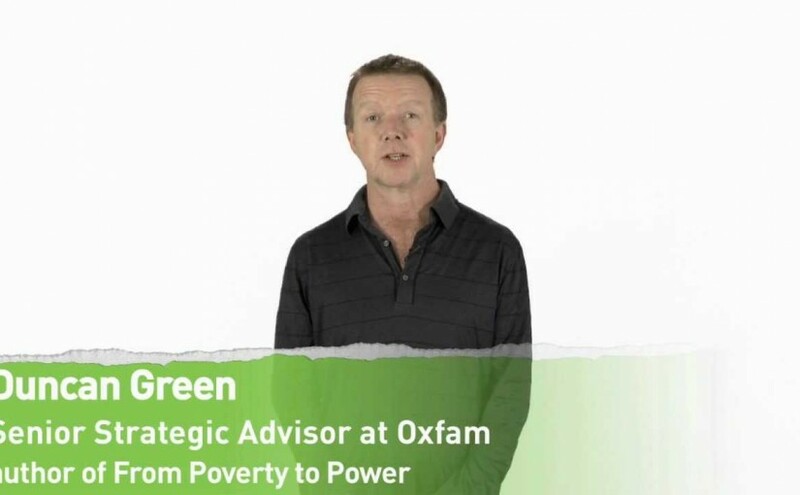 In From Poverty to Power Duncan aims to come up with an NGO narrative on development. His message is that active citizens and effective states are the main drivers of development. Duncan is increasingly focused on how change happens and From Poverty to Power is full of examples of this, from pond rights in India to the international campaign to ban landmines. Like Rakesh Rajani in the previous episode of Development Drums, Duncan emphasizes that change happens from within. Aid and the international system can help, or hinder, but are essentially secondary. My own view is that Duncan’s story about effective states is more compelling than the role he describes for active citizens. I see how active citizens can sometimes shape development for the better; but they can also sometimes stand in the way of progress. In either case, I suspect we may be in danger of overstating the role of active civil society. In the end my view is closer to the position reached by Acemoğlu & Robinson, though I don’t entirely agree with them either. But don’t take my word for it: listen to Duncan Green on Development Drums on the website, or download it from there to your phone or MP3 player. You can also subscribe to Development Drums free of charge in iTunes.